Often built with a lightweight tree. Not designed for heavy ranch work. 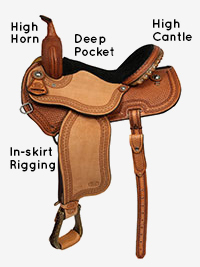 Designed with higher and lower cantle, lower cantle being more popular. 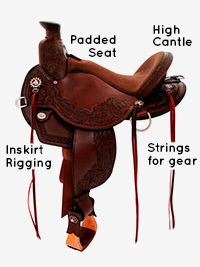 Rigging is usually in-skirt because of the stress put on the saddle. Often equipped with many leather ties to attach your gear. 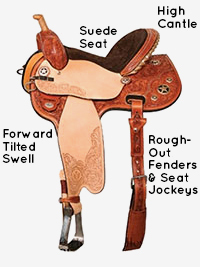 Flatter seat to allow movement and adjustment of rider. Seats are often padded suede. Often close contact skirting to help in the leg cues. Reinforced rigging for any type of light roping. Strong horn, made higher for holding on to. 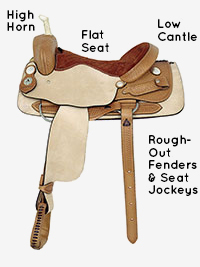 High cantle with deep pocket seat to hold you in. "Hip hugger" ridge around the back of the seat. High horn to hold on to. Forward tilted swell to give you more room to draw your guns. High cantle for extra security. Suede Seat to hold you in place. Roughout fenders and jockeys for extra stability. 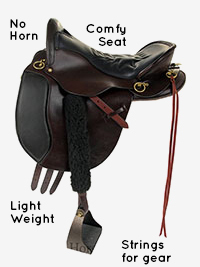 Low cantle, high pommel and horn. Flatter seat with slight rise at pommel. Jockeys and fenders often made out of rough out leather for better grip. 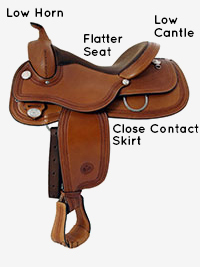 Back cinch and slim stirrups. Leather wear strap between fenders and bottom skirt. Very comfortable seat for long-endurance rides. Many strings for attaching gear. 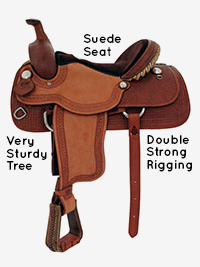 Often with center-fire rigging to keep saddle from tipping. Slick, hard seat for comfortable day-long use. Sturdy tree for rigorous ranch work. High cantles and back straps. Plate rigging, which is more comfortable for a horse that wears a saddle all day long. 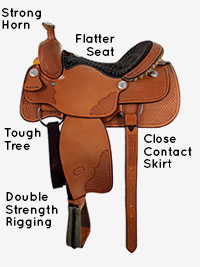 Close-contact saddle with skirts to allow for rider-horse communication through cues. Lower horn and pommel for movement of reins without interference. Often with a show-type silver and patterns for the arena. Flatter seat for hip movement. Very sturdy wood tree with bullhide, rawhide, or very strong fiberglass covering. Reinforced rigging attached to tree and back strap expected. Seats often suede and padded, many times in a pocket seat for good positioning. 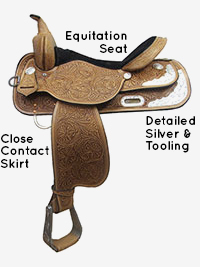 Comes with silver on the skirts, cantle, pommel, horn, and stirrups. 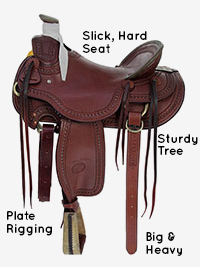 Seats are often equitation, which are balanced and have pocket to keep rider in the proper position. Often close contact with lower pommel and horn for better cues and rein control. 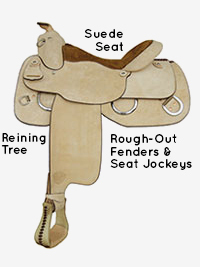 Often with reining saddle type tree. Low pommels and cut out skirts for closer contact. Many dees and rings to attach training devices or aids. Fenders and jockeys are rough out leather for better grip.